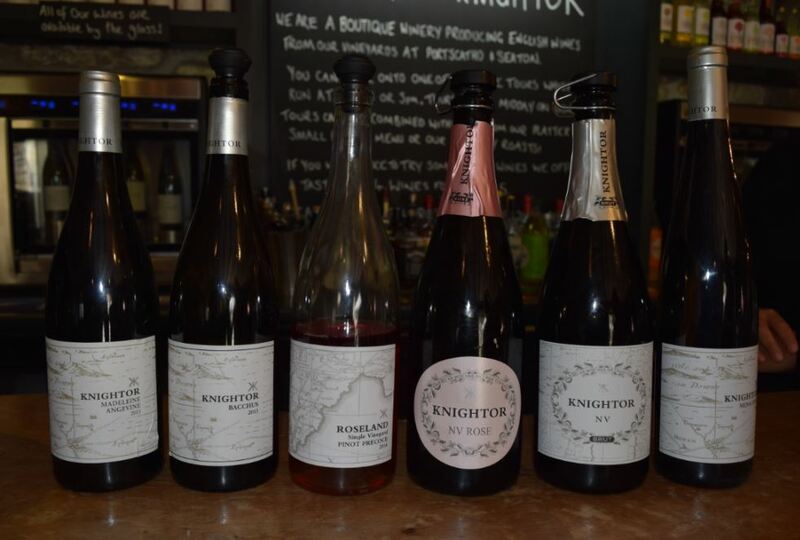 The following tasting notes originate from my recent UK vineyard visits, the full details of which can be viewed here (Camel Valley) and here (Knightor). I will post the second (and final) wine reviews in a forthcoming post. Bronze-gold in colour, with a definite tinge of salmon pinkness from the Pinot Noir skins. Fine bubbles with a good vibrancy. The nose was fairly subdued, but certainly light and fresh with touches of green fruit and pips. Almost a faint whiff of red fruit comes through, but nothing specific except for a touch of peach, so it is more a compendium of aromas. The palate was fine, delicate and moussy, almost melt in the mouth in terms of texture. Red fruits again come through from the Pinot grapes, with some strawberries and red currants melding well with the creamy texture. Touches of honey and white pepper come through alongside the ripe greener fruits of apple flesh and lemon citrus. This is a full and rounded wine that delivers a good length finish. Although still perky to drink, there are some early signs of good age to the wine, and it weighs up darker notes with the still-vibrant fruit. Salmon pink in colour with very vibrant fine pin-prick bubbles. The nose is clean red fruits, with both cherry and wild strawberries being evident. A fresh acidity draws in a raft of varying fruit characters running the gamut from tinned raspberries to stone fruits – perhaps nectarine, and then in to zesty lemon and followed up with a touch of apples and cream. This is a fine and delicate palate crammed full of freshness, but also a touch of sugary sweetness. The good length finish leads the green fruit on to the sourness of grapefruit, which rounds off the experience nicely. This wine is a blend of Rondo, Kerner, Dornfelder and Reichensteiner, all being fermented separately prior to creating the final blend. The separate musts of both the Rondo and Dornfelder are cold macerated for several days to extract both colour and fruit. The wine is named ‘Carpe Diem’ – Latin for ‘Seize the moment’ – to highlight the characteristics of their young, fresh wines. Visually this wine is a vibrant pink colour with a fine clear white water rim highlighting its youth. The nose is full of fresh red fruits of both strawberry and raspberry, rounded out with floral notes and touches of both custard and cream. A veritable compendium of fruit, the nose is nice and full. The palate showcases a well-balanced acidity that rests against the red fruits which, alongside strawberry, include both cranberry and plum. The fruit softens in the mid-palate and gains citric hints and a creamy texture which makes it all the more quaffable at this slightly lower than standard alcohol level (a very specific 10.27% if the literature is to be believed!). The finish is of a reasonable length. These Bacchus grapes were harvested on the 24th October 2013, and the resulting wine was just one of 1700 bottles produced. The appearance is a pleasing youthful lemon yellow which doesn’t prepare you for the golden, almost tropical notes that greet you on the nose alongside the citrus and toast. Twinned with the standard notes of green apple are yellow melon, and an almost wax-like texture. The palate is round, medium bodied and creamy and luscious. A blend of both green and yellow fruits fill the palate alongside a mouth-watering acidity. The touches of ripe melon and tropical fruits re-appear – particularly in the form of dried slices of pineapple. The mouthfeel has an oily (more so than butter) texture, like a good Chardonnay, and I can see why they are experimenting with wood ageing next year. At times when drinking this wine it is akin to taking a huge bite in to a fresh crisp Granny Smith apple. Wonderful, exciting and refreshing all at the same time.